Meet our yummiest blends: Moisturising Aloe Vera & Coconut, Nourishing Banana & Shea, Smoothing Coconut & Macadamia & Repairing Papaya & Amla. Four delicious blends with incredibly melting textures, instantly absorbed into hair with no weigh down. 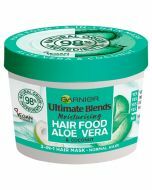 Introducing New Garnier Ultimate Blends Hair Food, our new way to nourish and condition hungry hair. 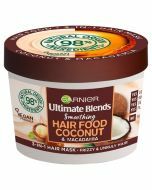 98% Natural Origin, 100% Vegan* blends, enriched with Super Food Extracts, for Super Hair. Four Hair Masks for four unique hair types, three ways to use, but only one result: deliciously nourished and naturally beautiful hair. *Vegan Formulas: no animal derived ingredients or by-products.